An intensive study of a neighboring dwarf galaxy has surprised astronomers by showing that most of its molecular gas -- the raw material for new stars -- is scattered among clumps in the galaxy's outskirts, not near its center as they expected. Composite view of the galaxy IC 10.
molecular gas (CO) in green. "This tells us that the galaxies we call dwarf irregulars are even more irregular than we thought," said Fabian Walter, of the National Radio Astronomy Observatory (NRAO) in Socorro, NM. "Our new work also shows that these galaxies probably are useful 'laboratories' for studying how stars were formed when the Universe was young," Walter added. Walter worked with Christopher Taylor of the University of Massachusetts and Nick Scoville of Caltech. The scientists presented their results at the American Astronomical Society's meeting in Seattle, WA. Using the millimeter-wave interferometer at Caltech's Owens Valley Radio Observatory, the astronomers combined 15 smaller images into a single mosaic to produce an image showing the location of Carbon Monoxide (CO) gas throughout a galaxy called IC 10, some 2.5 million light-years away. IC 10 is one of the Local Group of galaxies of which our own Milky Way is part. The telescope system was tuned to a frequency near 115 GigaHertz, where the CO molecule naturally emits radio waves. "We found the clumps of CO gas far from the galaxy's center, and not near the regions of current star formation," Walter said. "This tells us that stars may, in fact, form way out there in the outskirts of the galaxy, where we didn't expect," he added. Most of the galaxy's gas is atomic Hydrogen, composed of single Hydrogen atoms. Most of the galaxy's molecular gas is composed of Hydrogen molecules with two atoms each. Atomic Hydrogen can be seen with radio telescopes because it naturally emits at a radio frequency of 1420 MegaHertz. However, cold molecular Hydrogen cannot be observed with current telescopes. Instead, astronomers look for CO, which emits at several radio frequencies, and then estimate the amount of molecular Hydrogen based on how much CO they see. 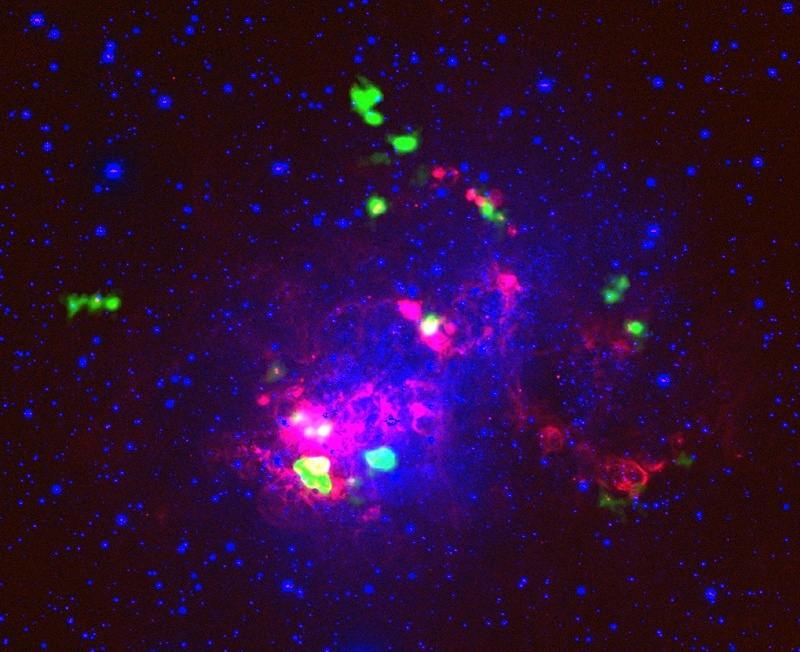 Based on the new observations of CO, the astronomers concluded that IC 10 has much less molecular gas than previously thought and apparently has a much smaller percentage of molecular gas than our Milky Way. The astronomers add that dwarf galaxies in general are found to have less of the heavy elements than larger, spiral galaxies. They are thus probably more similar to galaxies in the early Universe when there had been less time for stars to produce the heavy elements and then return them to their surroundings through supernova explosions. Studies of a dwarf irregular galaxy like IC 10 therefore give astronomers new insights about how stars formed in the distant past. In addition, many astronomers believe dwarf galaxies are the "building blocks of the Universe," from which larger galaxies were assembled through mergers. "The beauty of this is that dwarf irregulars are the most numerous type of galaxy, and many, like IC 10, are relatively nearby. That means we can learn about star formation in such extreme environments by studying nearby dwarf galaxies. That's fortunate, because we cannot observe extremely distant galaxies with sufficient detail," Walter said. Studies of molecules in galaxies also will benefit from the completion of the Atacama Large Millimeter Array (ALMA), an international millimeter-wave telescope project to be located in the high plains of northern Chile. With ALMA, astronomers will be able to study galaxies with greater detail and sensitivity to learn more about the nature of the building blocks of the Universe. Research with the Owens Valley Radio Telescope, operated by the California Institute of Technology, is supported by NSF grant AST96-13717. The National Radio Astronomy Observatory is a facility of the National Science Foundation, operated under cooperative agreement by Associated Universities, Inc.